Hanoi, the capital of Vietnam, must without a doubt be one of the most fascinating places in Vietnam. Hanoi is a vibrant city, a place filled with colors, scents, beautiful people and the tastiest food. If you don’t like busy cities, or prefer it clean, you might better stay away. 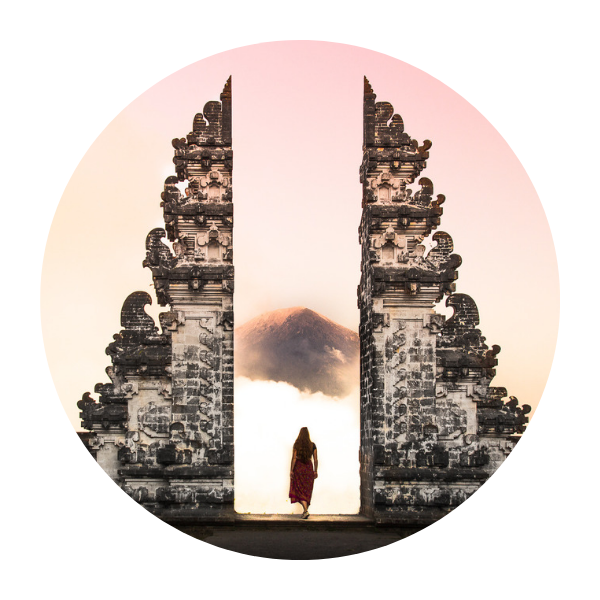 But for those who are willing to take on an adventure, experience city life in Vietnam, love bustling cities, or perhaps are even starting their Vietnam honeymoon here and who won’t back away from a little challenge… Hanoi is the place for you. After visiting Hanoi twice in 2015, and living in the city for a mere two months in 2017 and another 2 months in 2018 I have put together the ultimate guide to Hanoi, Vietnam, just for you! Hanoi Budget Accommodation – Central Backpackers Hostel (Old Quarter) – Vietnam, a budget destination, comes with many budget hostels too. Central Backpackers Hostel might be one of the most budget hostels I ever stayed at, and I gladly stayed there for 1,5 weeks! First of all: it has a perfect location, right in the old quarter. Second of all, staff is amazingly friendly and always willing to help. Thirdly, it includes breakfast and free beer for an hour every night. And lastly: it has a rooftop bar with good views, and a great atmosphere making it so easy to meet new people. What else do you need? Hanoi Backpacker Style – Vietnam Backpackers Hostel (Downtown) – Looking for a party? Vietnam Backpackers Hostel is the place to be. While a bit more expensive then Central Backpackers Hostel, it is also a bit more cleaner, the hostel is bigger and the bar is a lot bigger. The hostel has a great atmosphere, and although the dorms are small, the beds are comfortable and well equipped with a light and plug each. As Hanoi is the capital of Vietnam, you won’t be surprised by how many things there are to do in this amazing city, a city that you cannot leave out of your Vietnam itinerary! This city could keep you busy for weeks, but as most of us don’t have that much time when visiting Hanoi, here are some highlights of things you must see when visiting Hanoi! Coffee lover or not, Vietnamese coffee is definitely worth a try! I am not a big coffee drinker, but I wouldn’t pass on Vietnamese coffee ever, the taste is just amazing, especially in combination with the condensed milk, which makes it nice and sweet, just the way I like it. My favorites are egg coffee, which we found in a little cafe (Giangg Cafe, 39 Nguyen Huu Huan) in Hanoi and Vietnamese ice coffee. However, Vietnamese coffee is only one of the many delicious treats the Vietnamese cuisine has to offer. Be sure to try all the other delicious Vietnamese food in Hanoi such as Banh Mi, Pho and Bun Cha. While this is not on many people’s schedule when planning my visit to Vietnam, it might be one of the most unique experiences you will have in Vietnam. 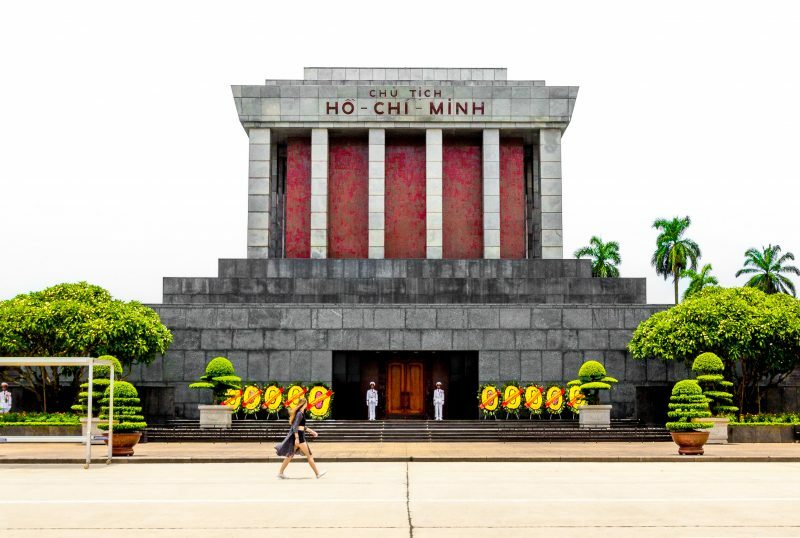 Ho Chi Minh’s wishes were that he was to be cremated and spread over the country so the land could be used for agricultural purposes, but the country chose to embalm his body and to display him in the Mausoleum, build for him, so they could honor their national hero. Ho Chi Minh is one of the few communistic leaders in the world whose body is embalmed and open for the public to visit. The Hao Lo Prison is also nicknamed the Hilton Hotel. The prison was initially build by French Colonists for political prisoners, the conditions of the prison were extremely hard for the prisoners living there and the cells, pictures and graphics will give an interesting representation of this. However, once the Vietnamese war started the prison was used by North Vietnam for U.S. prisoners. The conditions under which the U.S. prisoners were completely different. The americans played sports, were allowed to have chickens and even were given a christmas tree, with such it got the name of the Hilton Hotel. The Old Quarter is the heart of Hanoi, filled with busy streets, tons of shops, food stalls, and markets. This is the place to stay in Hanoi if you want to get a good feeling of the city. It might be intense at first, but trust me you’ll get used to it. It is also home to most of the bars, pubs and the night life of Hanoi in general. A perfect backpacker’s neighborhood with all your necessities right around the corner, and definitely the best place to buy your Hanoi souvenirs or to go shopping for jackets, bags or clothing! Hanoi is home to many many museums, perfect for escaping the rainy days, or even the intense heat of the sun during summer. Some of the most well known museums are the National Museum of Vietnamese History, Vietnamese Women’s Museum, Ho Chi Minh Museum and the Vietnam Military History Museum. Depending on your interests you might opt to see one or more of them, I was personally most impressed by the National Museum of Vietnamese History and the Vietnamese Women’s Museum! An area that is not often explored by tourists and travelers, and is home to probably the largest expat community in Hanoi. I, personally, lived at the West Lake for four months and it became my favorite place in Hanoi. While the Old Quarter is so busy and hectic, only a 10 min scooter drive away you’ll find the serenity of the lake. All around the lake you can find tons of coffee places, restaurants, little parks and even some temples. My favorite things to see: Quan Thanh Temple and the Tran Quoc Pagoda. Around the lake you can find many coffee places, a perfect stop to refuel and enjoy some delicious Vietnamese ice coffee (Ca Phe Sua Da). In the centre of the Old Quarter of Hanoi you can find the scenic Hoan Kiem lake. A piece of oasis in the middle of the hustle and bustle. Simply wander around the lake, sit at one of the many benches to enjoy the view or grab a bite to eat or drink at one of the cafes that are situated at the lake. Don’t forget to visit the Ngoc Son Temple, or the temple of the Jade Mountain, that is situated at the lake which will give you some perfect photo opportunities! The temple gets busy during the day, so be sure to visit early! The train street in Hanoi is a place that has been gaining popularity in the last two years with tourists and travelers visiting Hanoi. 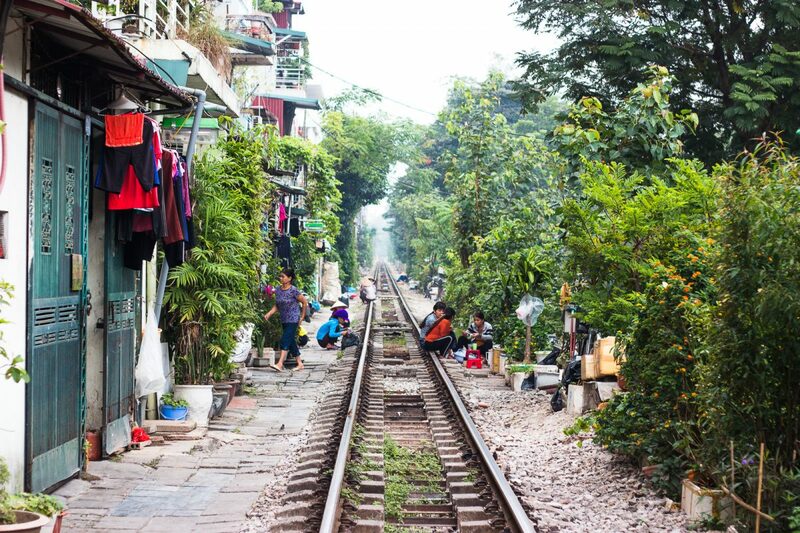 It is a train rail track that can easily be accessible from the main streets. The train track runs straight through the old quarter and is surrounded by houses and cafes and a couple of times a day the train will go straight through it! It is one of the most popular Instagram spots in Hanoi nowadays, and it will be highly unlikely to have the place to yourself unless you plan to visit early in the morning! Find the train street on the map here! Located right next to Ho Chi Minh’s Mausoleum you can find the beautiful French Quarter. Wander around the area to see the stunning yellow and green buildings, to admire the architecture and to enjoy some delicious coffee. While you are in the area be sure to make a stop at the Imperial Citadel before continuing your journey through Hanoi. The French Quarter is an area that is often forgotten by tourists and travelers as they tend to stick to the Old Quarter, but it is definitely a place that is worth to be explored! Looking to work in Hanoi? Check out our complete guide to teaching English in Hanoi! Only 2 hours south of Hanoi you can find the area of Ninh Binh. Ninh Binh province is separated into smaller areas, Trang An, Tam Coc and the Hoa Lu Ancient Capital. 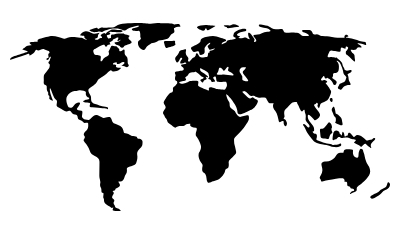 However, as these areas are all located so close to each other most tours offer packages to see them all in one day. Ninh Binh is famous for its vast limestone karst formations, similar to Ha Long Bay, but instead of ocean it is surrounded by stunning rice fields and small rivers. Take a boat ride and float down the river in Trang An to witness some of the most magical scenery you will find in Vietnam, or rent a bike and cycle through the vast formations in Tam Coc. If you get the chance, and if your tour allows, be sure to climb all the way up to the Mua Caves, to find one of the most beautiful views over Ninh Binh. 500 steps to the top, but on a clear and sunny day, the view will be worth it, as it will be unlike any other view you will experience in Vietnam. Northeast of Vietnam’s Capital you can find the world famous Ha Long Bay. 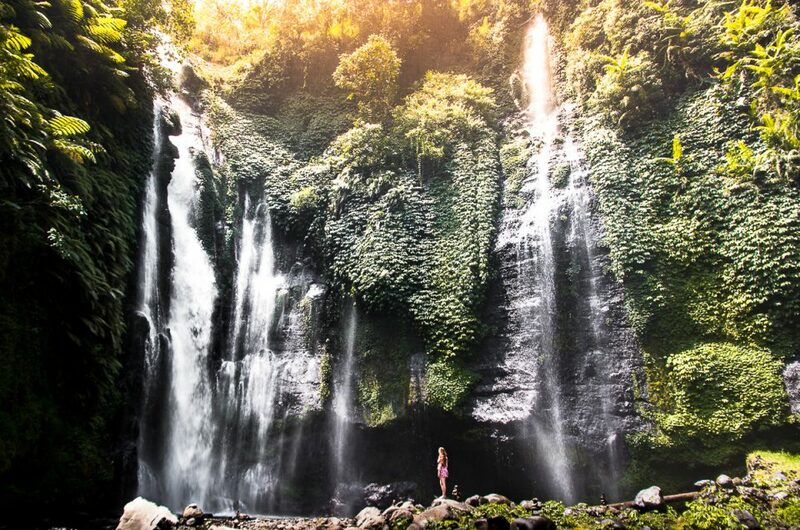 Miles and miles of limestone karst formations rising from the ocean, it truly is a magical site. Ha Long Bay is a must see when visiting Vietnam, and if you don’t have the time to go on a cruise through the UNESCO World Heritage Site, a day trip will surely give you a taste of its beauty. Many of the day trips will take you to one of the most stunning viewpoints over Ha Long Bay, so you can witness a glimpse of the beauty of North Vietnam! If you do have the time to stay longer, you might want to opt to book a 1 or 2 night Halong Bay Cruise or perhaps even visit Cat Ba island, the largest island in Vietnam, and stay there for a couple of nights to get the full Ha Long Bay experience. While visited by a lot less travelers and tourists compared to the famous sights of Ninh Binh and Ha Long Bay, Mai Chau is still worth a visit. The area of Mai Chau is located roughly 3 hours South West of Hanoi. The area of Mai Chau is filled with stunning rice fields that are surrounded by the mountains. As traveling there often takes over 3 hours it is not uncommon to do a homestay at one of the ethnic tribes in Mai Chau. Rent a bike and cycle around the rice fields to find some stunning and peaceful views! As there are so many things to do in Hanoi, it is best to use your time wisely and to optimize your days filled with some of the most unique and must see things to do in Hanoi. We advise to stay at least for 4 days in Hanoi to get a full grasp of the beauty of this hustling and bustling capital. And to help you out we have created a 4 Day Hanoi Itinerary for you! Start your day of the right way by waking up with a delicious cup of egg coffee at Giang Cafe. 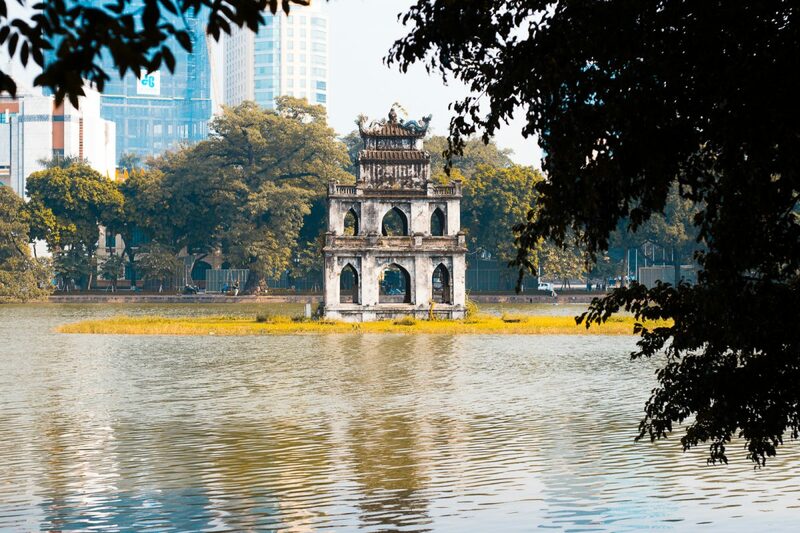 When all fresh and refueled stop at the nearby Hoan Kiem Lake for a lush view over one of the most famous lakes in Hanoi and explore the Ngoc Son temple. Head down South to visit the Vietnam’s Women Museum and the Hoa Lo Prison to learn more about Vietnamese past and history! Make your way back up North to visit the St Joseph’s Cathedral but before be sure to enjoy some of Vietnam’s delicious street food and grab lunch on your way. Opt for a delicious Banh Mi sandwich or perhaps a hot steaming bowl of Pho. After you have finished your lunch an have seen the St Joseph’s Cathedral make your way to the last stop of the day: Hanoi Train Street. Be sure to have your camera ready as this might possibly be the most photogenic part of your day! Now that you are done sightseeing head back to the old quarter to wander around, if you still have some energy left, or grab some dinner with draught beer called Bia Hoi that can be bought at many places in the old quarter for something as cheap as 5000 Dong a glass (€0,20). As you have now explored the heart of Hanoi and had a good taste of Hanoi itself, opt to see more of Northern Vietnam by going on a day trip. Hanoi is the perfect “home base” to explore some of the most beautiful places of North Vietnam and a trip can easily be arranged with the help of your hostel or hotel or by booking a trip at one of the hundreds of tour agent offices you will find in the city! 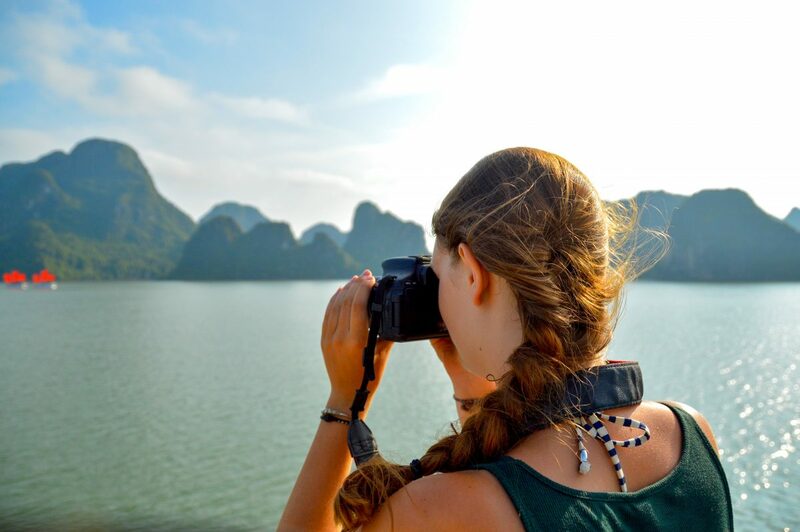 We have named three of the biggest day tours above: Ninh Binh, Ha Long Bay and Mai Chau Valley! Enjoyed your day trip? Now it is time to get back into the hustle and bustle of the city and to witness more of Vietnam’s beauty. 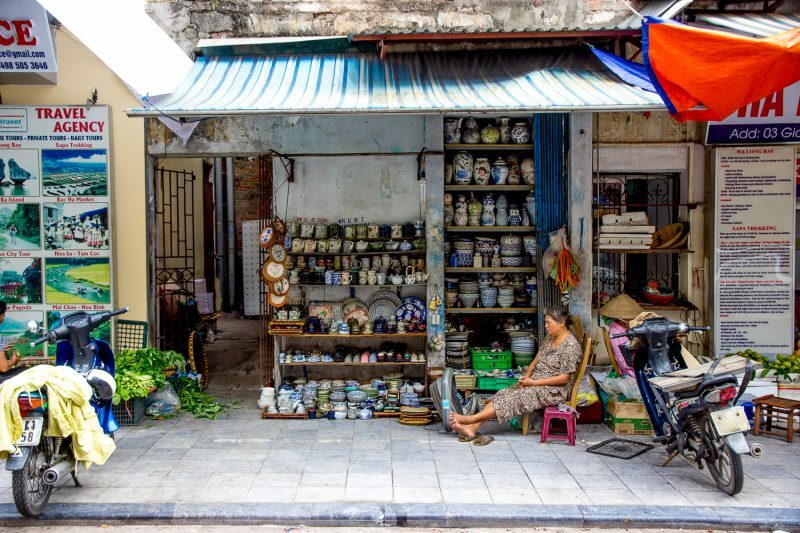 This time you will need to leave the old quarter to find some more hidden treasures that Hanoi has to offer! 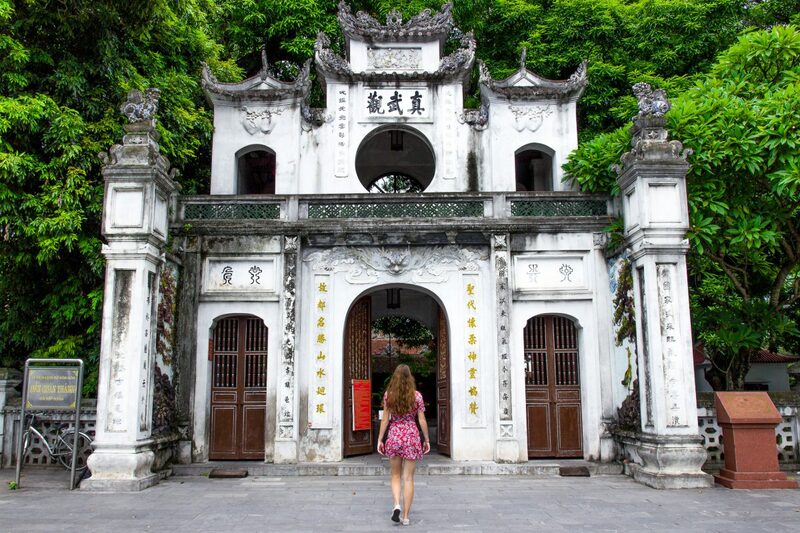 Start your day at the Temple of Literature to see one of Hanoi’s most beautiful temples, a temple that is often forgotten by many travelers and tourists as it’s location is a bit further then most of the sights in Hanoi! After the Temple of Literature head North to see Ho Chi Minh’s Mausoleum. If you are planning on entering the Mausoleum to see Ho Chi Minh’s body check with your hotel or hostel on the visiting hours as they might change. Moreover, be sure to dress respectfully (arms and legs covered) and to go as early as possible as the regular lines are long. 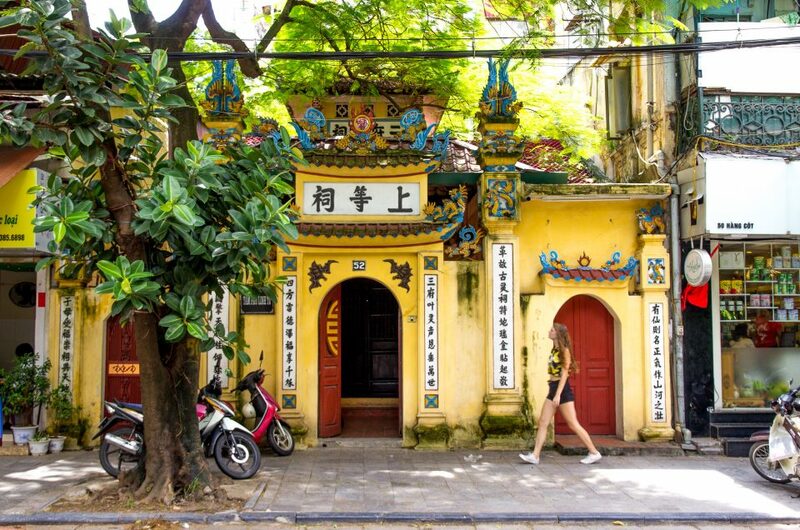 Now that you have seen one of Hanoi’s most visited sights it is time to explore the French Quarter wander around the buildings to see some stunning architecture and be sure to stop at one of the many cafes for a delicious cup of Vietnamese ice coffee and some delicious Vietnamese treats. Nearby the HCM Mausoleum you can find the One Pillar Pagoda, a place you might want to add to your bucket list! When exploring the French Quarter don’t forget to stop at the Citadel as your last stop for the day as at this point your feet will probably be sore from all the wandering around. Head back to the Old Quarter for some dinner and Bia Hoi to finish off your day! Your final and last day in Hanoi! As many people only stop in Hanoi to see the rest of Vietnam’s beauty, these sights are often skipped and forgotten, but if you have the time, they definitely are worth visiting. 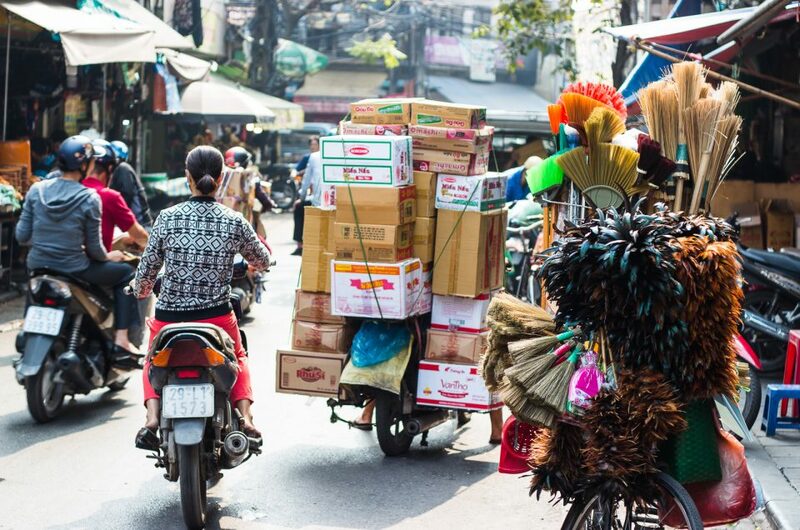 As these are the last of Hanoi’s sights and they are a bit scattered, you might want to opt to use Grab to avoid hurting your feet even more after all that walking! Start your day exploring the West Lake, an area that is popular to the many expats that live in Hanoi. Visit the Quan Thanh Temple and the Tran Quoc Pagoda early in the morning to have the place all to yourself and to enjoy the peaceful view over the lake. Be sure to stop for lunch at one of the many restaurants that are close to the lake to enjoy some more of that delicious Vietnamese food! After lunch make your way to the Long Bien Bridge which will give you some spectacular views over the river. The Long Bien Bridge is a French built bridge and is one of the busiest and most hectic bridges you will find in Hanoi! 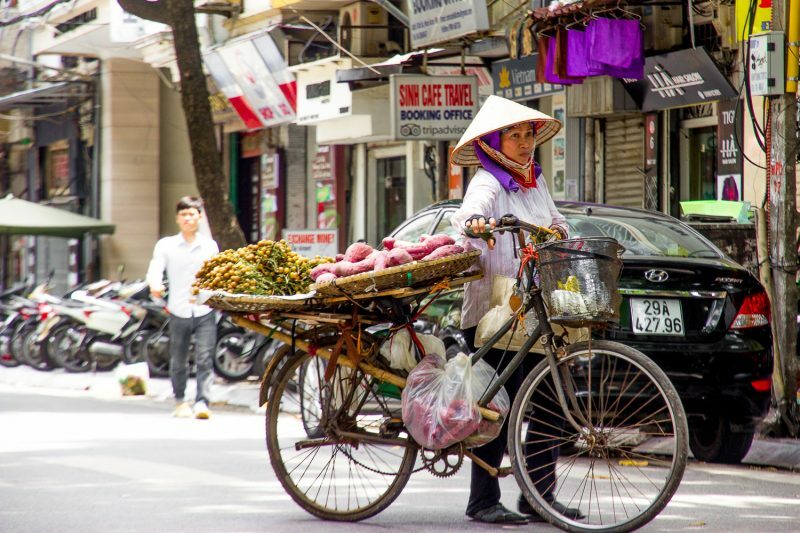 After seeing the Long Bien Bridge opt to go back to Hanoi’s old quarter to do some more shopping and wandering before heading to your next destination in North or South Vietnam! You will most likely need a visa. 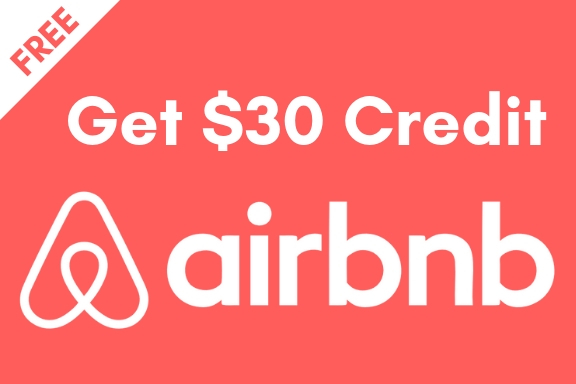 In case you do, you can apply for this often online in case you are flying into the country, or several embassies and travel agencies in bordering countries if you were planning to travel overland. Vietnam’s currency is Dong and with 25000 Dong to a Euro, the currency might be a bit confusing. That said, there are no coins, and with the currency looking a lot like each other, be sure not to get confused and overpay. Check with your doctor beforehand if you need any vaccinations. Water is not drinkable, be sure to either filter it with a filtered water bottle or to buy bottled water. Vietnamese traffic is crazy, just stay calm, the bikers are used to the busy streets and people walking everywhere. Locals are extremely friendly and almost always willing to help, even if they don’t speak English. Grab: Grab is the Southeast Asian form of Uber, and over there cheaper and easier to use. Simply download the app on your phone, insert your number and you’ll be ready to go. Grab still operates with cash, so make sure to keep small cash for these cheap rides. In Vietnam you can even get a GrabBike, where the driver will pick you up on a scooter, supplies you with a helmet and will bring you to your destination! A 15 min bike ride came as cheap as 25000 Dong (roughly €1,-). GrabTaxis are also available, which will roughly be 200,000 to 225,000 to the airport (roughly €8-€9), and are more suitable for groups and longer distances. Download the Grab App here! Bike: Planning to stay a bit longer, perhaps even to ride a motorbike around the North or all the way to the South? Hanoi is not the easiest place to bike around. It is busy, hectic, and there are a lot on unspoken rules. 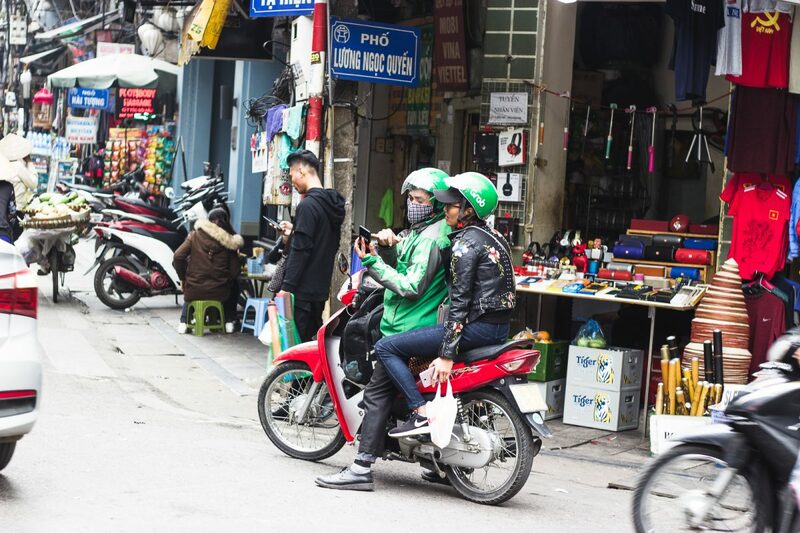 If you have no experience riding a motorbike, Hanoi, Vietnam is not the best place to start. If you do have some experience, and are interested, riding around the country or the city on a motorbike was one of my favorite things. If you go rent a bike: don’t ever give them your passport for keeping, there are other shops that will allow you to rent one without. If you want to know everything, I have written a complete guide to riding a motorbike in Vietnam. It includes, buying or renting a bike, a checklist for when you actually buy a bike, safety and many more tips from 5+ months of experience riding a bike in Vietnam! 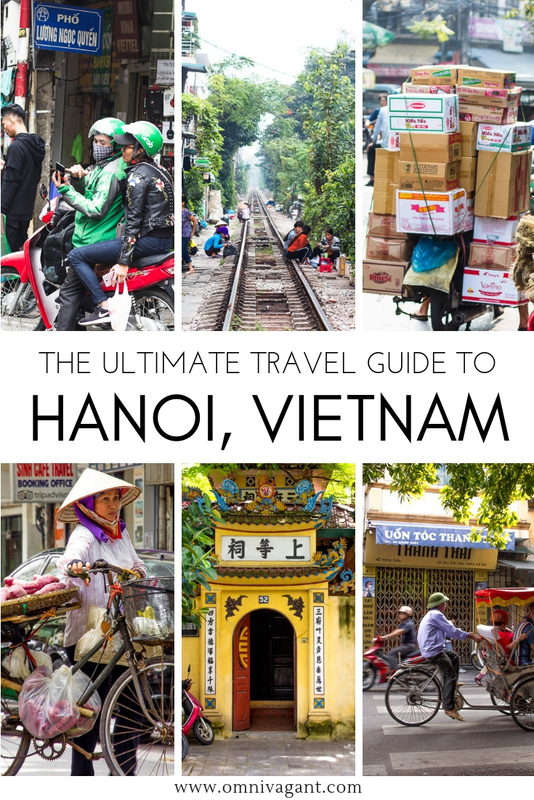 The Ultimate Travel Guide to Hanoi! Pin It! 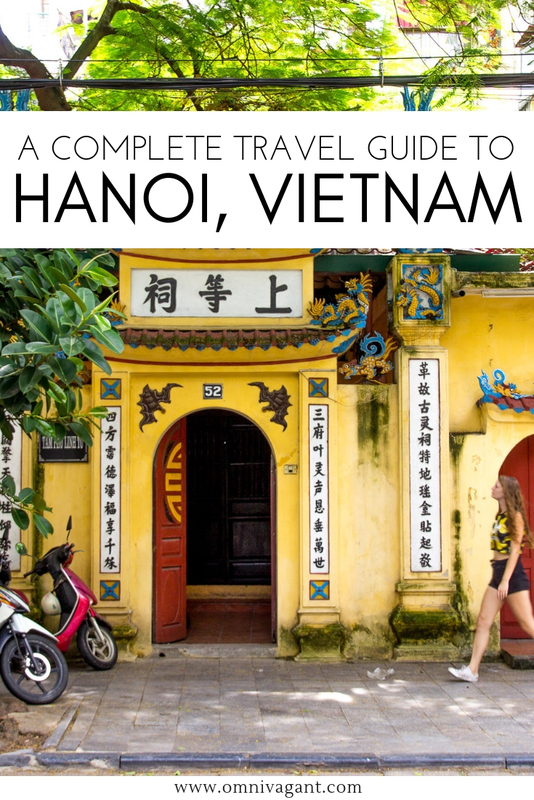 And there you have it, everything you need to know about traveling to Hanoi! 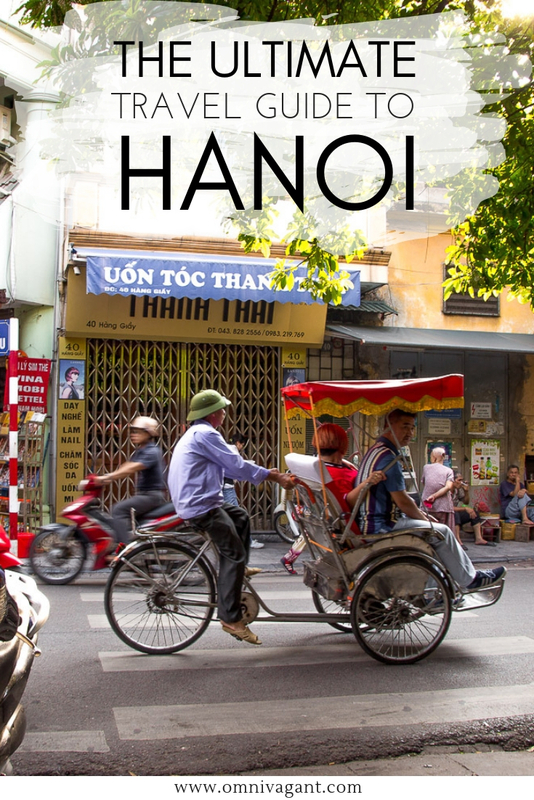 Have you been to Hanoi before? Is there anything we left out on our Hanoi guide, be sure to tell us in the comments down below! And oh, don’t forget to pin it! I love your detailed guides and amazing pictures. I’m a coffee lover and would want to the egg coffee you have mentioned if ever I visit Vietnam. Is it really egg+coffee? How does it taste like? Thank you so much! Yes, they use an egg yolk to create a foam like topping on top of the coffee! I believe the egg yolk has been whisked with condensed milk and a tiny bit of coffee. I personally think it is absolutely delicious, almost like drinking a pastry!